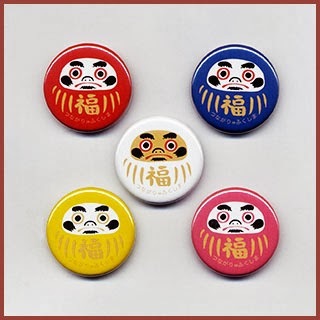 of the Daruma Museum !
. Amulets, Talismans and Folk Toys from Japan . 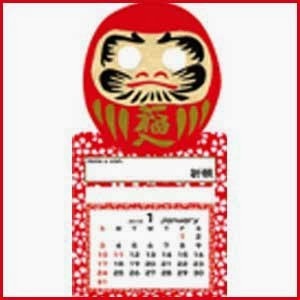 Most vocabulary is covered in the text of the Darumapedia. - - - SEARCH all my articles ! Below are words not yet covered in a full article. If you copy the Japanese kanji given below, you will find photos for most items in the list below.
. - Book Titles - updated LIST - . 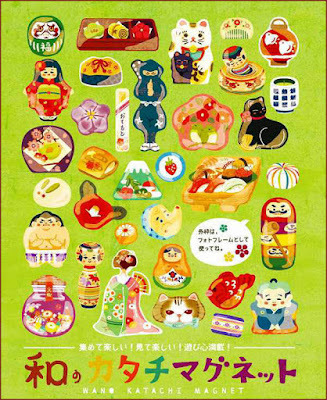 jizai okimono　自在置物 realistically shaped figures of animals, plants etc. 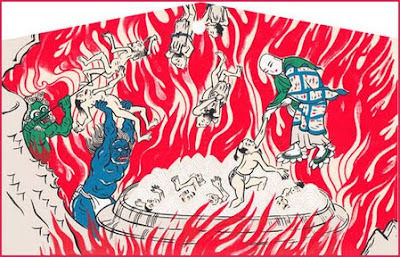 kaika ninjoo kagami 開花人情鏡 "A mirror of Human Nature in an Age of Enlightenment"
kami asobi 神遊び　divine play. Deities come together to enjoy and feast. koboku こぼく【古墨】 "Chinese old ink stick"
kohitsu こひつ【古筆】 "painting or calligraphy by the ancients"
koshiore ningyoo 腰折れ人形 articulated doll "bending hips"
kyokujitsu ki きょくじつき【旭日旗】 "Rising Sun" flag, for the armed forces. ..... kakemise　掛店　”suspended store"
Nihon minzoku zufu　日本民族図譜　"Native Customs of Japan"
rikkokushi 六国史 lit. 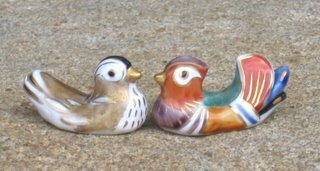 "History of six countries"
robin's egg blue, robin egg blue 薄緑がかった青色, eggshell blue, in the color of the American Robin. Used as a glazing for ceramics. 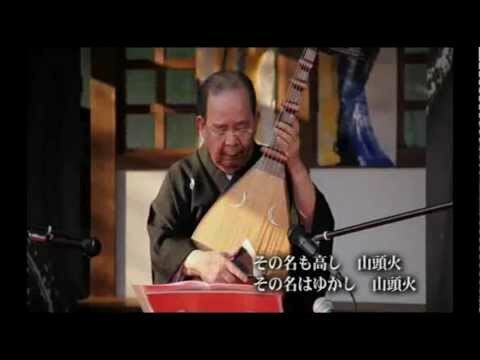 sankei mandara 参詣曼荼羅 (さんけいまんだら) "pilgrimage mandala"
shingi Shingon shuu しんぎしんごんしゅう【新義真言宗】 "school of the new shingon dogma"
Shooshoo hakkei 瀟湘八景 "Eight views of the Xiao and Xiang Rivers"
takabori たかぼり【高彫り】 engraving technique, so that the motive "stands out high"
tokuwaka ni go-manzai 徳若(とくわか)に御万歳(ごまんざい) "Be always young and enjoy longevity"
tooroo no ono 蟷螂(とうろう)の斧 "ax of a praying mantis"
yakuryoo 役料 "expenses for public duty"
yamato neko 倭根子 (やまとねこ) praizing word for the tenno. "Das Liebe Kind von Yamato"
yaso 八十 - 80, meaning "a lot"
Not only about Japan, but search for "Japan"
. 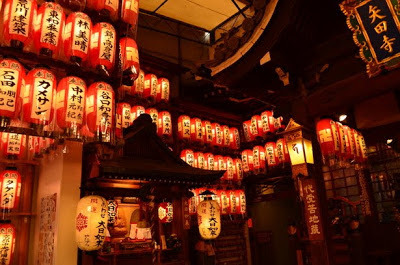 Personal Names - to be explored .
. Daruma Museum - Japan . KYOTO--The Kyoto National Museum made a startling discovery during routine preparations for an upcoming special exhibition here. A staff member noticed the name of a renowned but little-known sculptor scrawled faintly on two of three Buddhist statues that will be displayed. Venerated for centuries at Monmyoji temple, the statues turn out to have been carved by a disciple of Kaikei, who lived in the Kamakura Period (1192-1333). 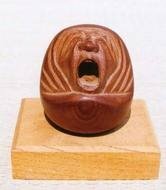 The museum said Dec. 17 that the wooden Amida Sanzonzo statues at the temple in Sakyo Ward are definitely works by Gyokai, an artisan of whom little is recorded. In preparation for its special exhibition “Art of the Ji Shu,” the museum removed the statues from a sacred “zushi” cabinet at the temple belonging to the Ji Shu sect to be photographed. It was then that staff noticed that the word “Gyokai” was written in ink on the bases of two statues. The 83-centimeter-tall Amida Ryuzo is flanked by the 59-cm Kannon Bosatsu Ryuzo and 58.2-cm Seishi Bosatsu Ryuzo. As a set, the statues are known as Amida Sanzonzo. Takeshi Asanuma, head of the Cooperation and Education Department in the museum’s Curatorial Division, examined the statues and said the signature was handwritten by Gyokai. 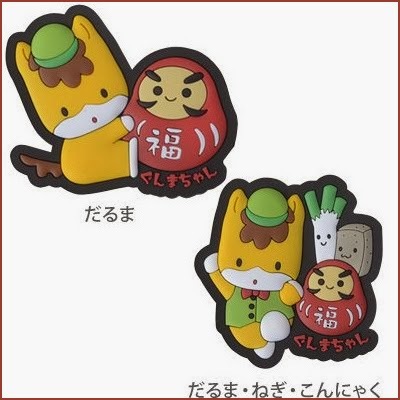 He also said though Gyokai’s signature has not been found on Amida Ryuzo, the statue is likely Gyokai’s work as well, because it matches characteristics associated with the master carver. 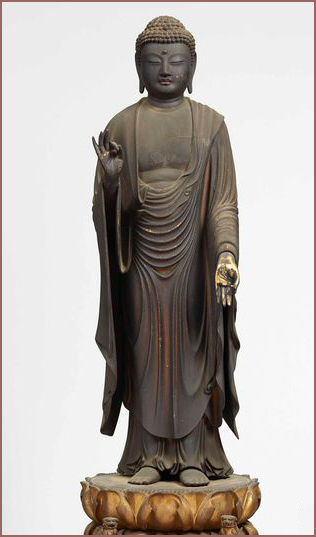 Noting that the statues look vigorous and clean-cut, Asanuma estimated that Amida Sanzonzo dates back to the late 1230s and 1240s, when Gyokai was head of a sculptor's studio. The Amida Sanzonzo will be displayed from April 13 through June 9. 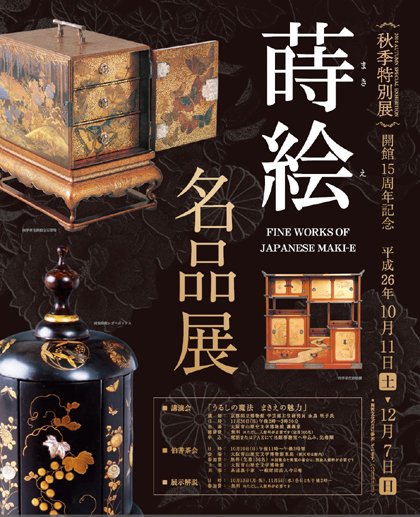 The exhibition is co-sponsored by The Asahi Shimbun and other parties. 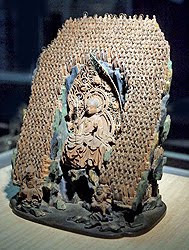 For details, contact the Kyoto National Museum at 075-525-2473.
. Fudo and related Sutras　不動とお経 . At that time in the Great Assembly, there was one Vidyaraja. This Great Vidyaraja possesses great majestic strength. He has the virtue of great compassion, thus he appears in a bluish-black body. He has the virtue of great meditative stillness, thus he sits on a vajra-rock. He has great wisdom, thus he manifests great flames. 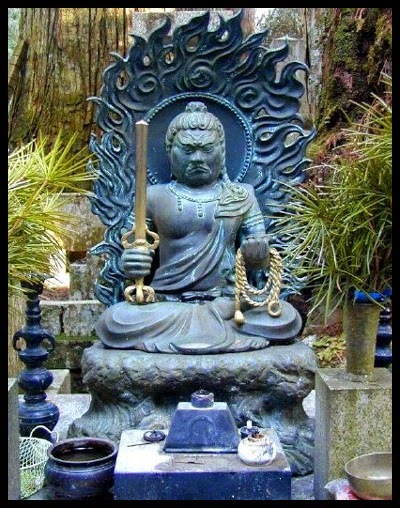 He grips the sword of great wisdom to destroy greed, anger, and ignorance. He holds the rope of samadhi to bind those who are difficult to tame. He is the markless Dharmakaya, identical with all-encompassing space itself, thus he has no dwelling. His only dwelling is in the minds and thoughts of living beings. The minds and inclinations of all beings are different. In accordance with the minds of living beings, benefit is given and what is sought for is attained. At that time, all in that great assembly heard this teaching and were filled with joy. Faithfully receiving it, they reverently put it into practice. Once during an assembly of the Buddha's followers, Fudo appeared. And great wisdom was manifest in the flames surrounding him. His samadhi-rope bound the enemies of Buddhism. Fudo settles nowhere but lives in the hearts of sentient beings. Devoted servant of all, he encourages the well-being and ultimate salvation of sentient beings. When the entire assembly heard this teaching they joyously believed and received it. sono toki daie ni hitori no myou-ou imasu. kono dai myou-ou wa dai-iriki ari. daihi no toku no yueni shoukoku no katachi wo genji, daijou no toku no yue ni kongouseki ni zashi, dai-chie no yue nidai-kaen wo genjitamau. daichi no ken wo totte wa ton-jin-chi wo gaishi, sanmai no saku wo jishite nanbuku no mono wo bakushi, musou no hosshin, kokuu doutai nareba, sono juusho monashi. tada shujou shinsou no naka ni juushitamau. shujou no isou kakkaku fudou nareba, shujouno kokoro ni shitagaite riyaku wo nashi, shogu enman su. sono toki ni daie, kono kyou wotokitamau wo kikite, mina ooini kangi shite, shinju shi bugyou shiki. Here I will introduce just a few of them. This statue is about 2 meters high and huge flames are standing before Jizo. who had a vision of Jizo during his meditations. Saijuku Jizo 代受苦地蔵 Jizo who takes on our sufferings and hardships. The worship of this Jizo helps blind people find their way around and out of hell, hence the huge flames in front of the statue. 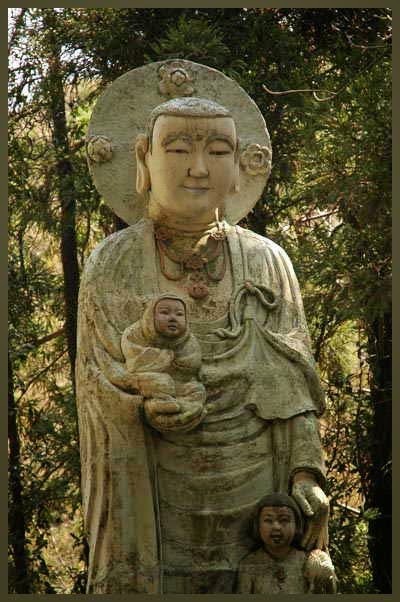 Jizo looks almost like a Fudo Myo-O. I could not find a photo of this Jizo yet. According to histories passed down within the temple itself, the temple was founded at Gojô-bômon in the early Heian period as a branch temple of the Yatadera still standing and active in Yamato province (Nara). Temple lands changed, and in 1579 the temple was moved to its current location. The statue of the bodhisattva Jizô enshrined in the main hall as the chief object of worship is a two-meter tall standing figure, and is said to have been carved from the dark earth of the underworld by Mankei (aka Manmai), the founder of the temple, who met the true Jizô there, and copied his likeness or form. Worshippers gather to pray to this statue as the Jizô who saves those who have died and are in hell. 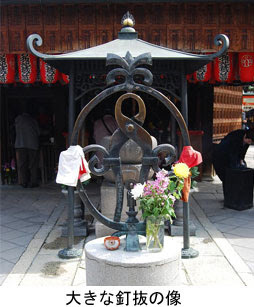 The temple's bell, in contrast to the "Welcoming Bell 迎え鐘" of the temple Rokudô-chin-ô-ji 六道珍皇寺, is called the "Sending Bell 送り鐘," and is rung to help send the spirits of the departed to the afterlife without them getting lost on the path. 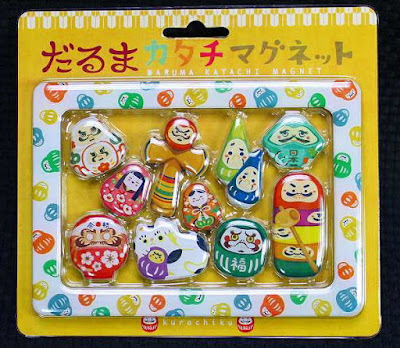 Small cuddely Jizo dolls (nuigurumi　ぬいぐるみ） as amulets. 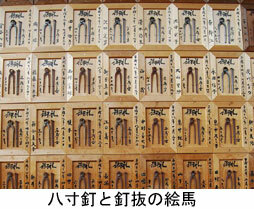 Many people offer votive tablets with a nail and nail puller. There are maybe more than 1000 in the precincts now. In the Muromachi period there was a merchant who suffered from severe pain in his hands and made a vow to come to this Jizo for 7 days and pray that his pain KU might be taken away NUKI. "In one of your former lives you have been cursing people by sticking nails into a straw doll, hammering them into a tree at midnight. Now you have to feel the pain of these hails in your own hands." And Jizo showed the man two large nails. When the man woke up, his pain was gone. He hurried to the temple and saw the two bloody nails in front of the statue of Jizo. Greatful for the help, the man made another vow of 100 visits to the temple (o-rei mairi お礼参り) . Since then, the Jizo got his name and people come with prayers to get rid of all kinds of KU, pains and hardships in their body and mind. There are other statues with this name in Japan. (guardian deity of Rain Stopping) turned to "Meyami Jizo" (a guardian deity of the eye disease), after a couple prayed for healing to the "Rain Stopping Jizo" and the wife got healed. This temple belongs to the Jodo sect of Buddhism. 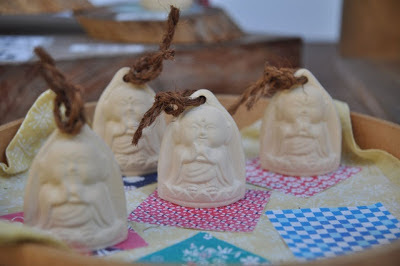 It is also known as the Meyami Jizo. In 1022, the buddhist monk-sculptor Jocho worshipped a guardian deity in the northeast of the "Shijobashi Bridge" and this is the beginning of this temple. 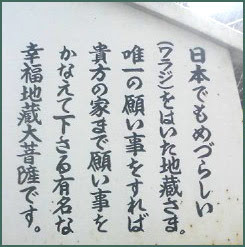 When "Kamogawa-river" was flooded in 1228　Nakahara Tamekane was able to hold back a flood thanks to the guardian deity. 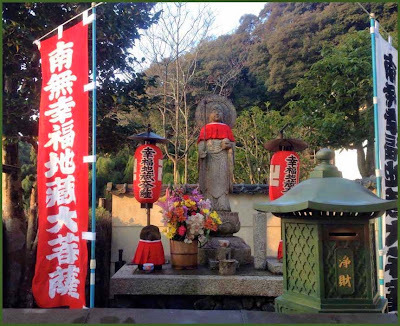 Nakahara Tamekane who had deeply expressed gratitude enshrined the guardian deity here. 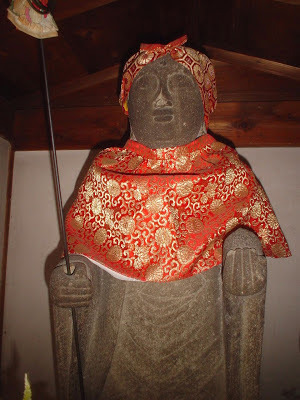 And the guardian deity was called as Ameyami Jizo（guardian deity of Rain Stopping）. 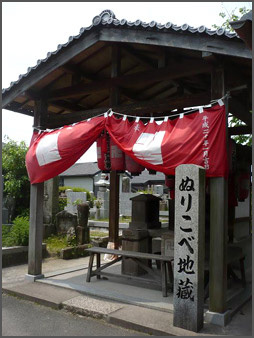 Later, the word “Ameyami Jizo” turned to “Meyami Jizo"（a guardian deity of the eye disease）. 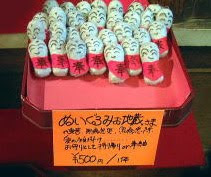 Today, “Meyami Jizo" is believed in as a guardian deity of the eye disease recovery.
. Jizo to heal eye diseases . nurikobe Jizo ぬりこべじぞう "rub your pain on Jizo's head"
The statue in the small hall is only 1 meter high. There are two theories about its naming. to keep illness inside (the statue of Jizo) 病気を封じ込める. 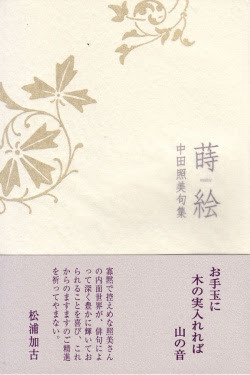 Since the Edo period it is expecially useful for toothache. This statue is very small and was ment to be carried while traveling, hence the small shrine to protect it. Around the center statue there are almost 1000 little one's, at the sides, at the back and all around. The main statue is 3,3 cm. 後柏原天皇 GoKashiwabara Tenno in 1501.
it is very impressive in its concentrated power. ＊＊＊＊＊　. Amulets and Talismans from Japan .
. Kyoto 京都　Hana no Miyako . is a Japanese short-necked fretted lute, often used in narrative storytelling. The biwa is the chosen instrument of Benten, goddess of music, eloquence, poetry, and education in Japanese Shinto. It arrived in Japan in two forms. Since that time, the number of biwa has more than quadrupled. 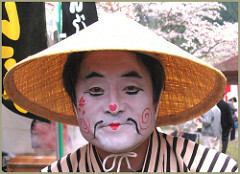 Guilds supporting biwa players, particularly the biwa hoshi, helped proliferate biwa musical development for hundreds of years. Biwa hōshi performances overlapped with performances by other biwa players many years before heikyoko and continued until today. This overlap resulted in a rapid evolution of the biwa and its usage and made it one of the most popular instruments in Japan.
. . . . . By the late 1940s, the biwa, a thoroughly Japanese tradition, was nearly completely abandoned for Western instruments; however, thanks to collaborative efforts by Japanese musicians, interest in the biwa is being revived. 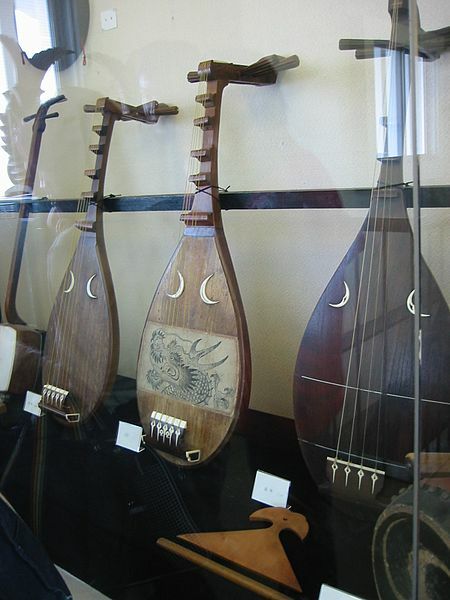 Japanese and foreign musicians alike have begun embracing traditional Japanese instruments, particularly the biwa, in their compositions. While blind biwa singers no longer dominate the biwa, many performers continue to use the instrument in traditional and modern ways.
. Japanes Musical Instruments . 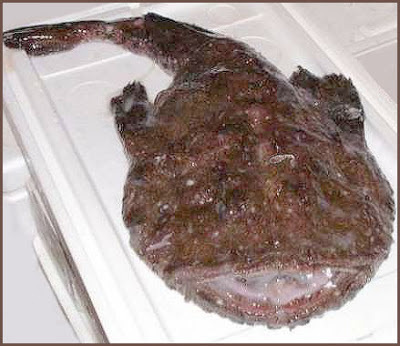 because its form is like the musical instrument biwa lute.
. ankoo 鮟鱇 anglerfish, goosefish, monkfish .
. watayumi ya biwa ni nagusamu take no oku .
. biwakoo no yo ya samisen no oto arare .
. Taneda Santoka (Taneda Santooka) 種田山頭火 . 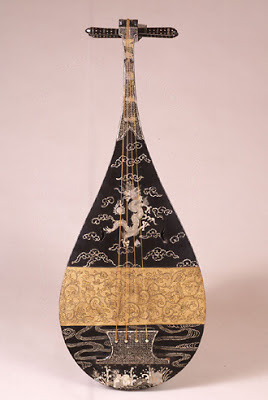 a heavy biwa lute .
. Laquer, Lacquer, Lackarbeiten 漆　urushi . 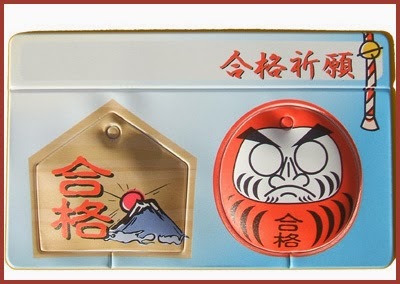 CLICK for more maki-e Daruma ! 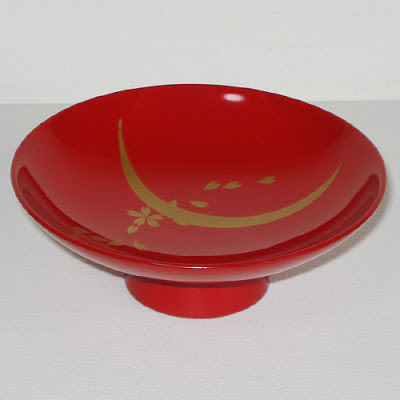 is Japanese lacquer sprinkled with gold or silver powder as a decoration using a makizutsu or a kebo brush. 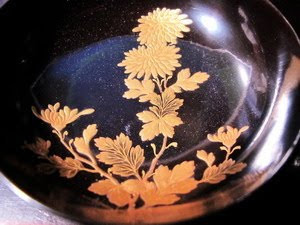 The technique was developed mainly in the Heian Period (794–1185) and blossomed in the Edo Period (1603–1868). 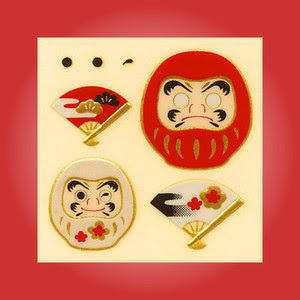 Maki-e objects were initially designed as household items for court nobles, they soon gained more popularity and were adopted by royal families and military leaders as an indication of power. To create different colours and textures, maki-e artists use a variety of metal powders including gold, silver, copper, brass, lead, aluminum, platinum, pewter, as well as their alloys. Bamboo tubes and soft brushes of various sizes are used for laying powders and drawing fine lines. 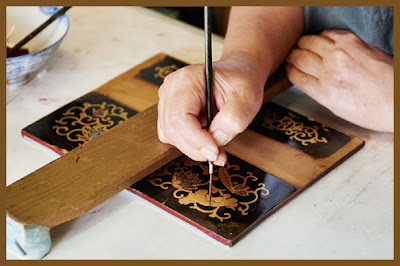 As it requires highly-skilled craftsmanship to produce a maki-e painting, young artists usually go through many years of training to develop the skills and to ultimately become maki-e masters. Kouami Douchou (1410–1478) was the first lacquer master linked to specific works. His maki-e works used designs from various Japanese contemporary painters. Kouami and another maki-e master, Igarashi Shinsai, were originators of the two major schools of lacquer-making in the history of Japan. is one of the three major techniques in maki-e making. Developed in the Muromachi Period (1336–1573), the technique of takamakie involves building up design patterns above the surface through a mixture of metal powder, lacquer and charcoal or clay dust. 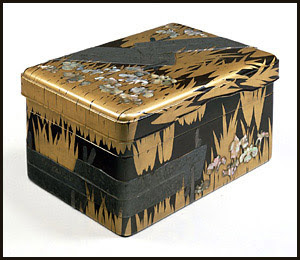 Another special kind of maki-e is togidashi maki-e, where a black lacquer without oil is put on the metal decoration as an additional coat. CLICK for more maki-e samples ! They use all kinds of special tools, mostly made by themselves, to apply patterns to the itmes. During the work the craftsman must take care not to breath too much on the piece in front of him. Tools decorated with maki-e were given as wedding presents to Samurai, therefore the same pattern had to be repeated on many things. In Edo castle was a special workshop for this purpose. 徳川幕府　O-saikujo 御細工所（おさいくじょ）Center of fine Craftswork, from 1603 till 1866 in Edo 江戸城本丸. O'er an inn the moon. 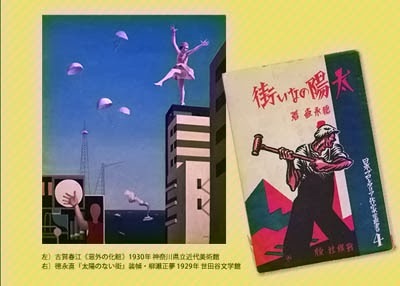 更科紀行 Sarashina Kiko. At a lodging in Kiso, where he was offered a rustic Sakazuki sake cup with a simple maki-e laquer motif. Or even a plain one with no image at all.
" 'Hey,' I said to everyone, 'let's have a drink on this moon-viewing festival,' and wine cups were brought out. They seemed rather large and unrefined, their gold lacquer work quite crude. The cultured elite from the capital would think them tasteless, they wouldn't even deign to touch them, but I was surprisingly delighted, as if they were jasper bowls or jeweled cups, coming as they did from this place." Barnhill also notes that in a variant of this haiku, the first line is 'tsuki no naka ni' ("inside the moon") rather than 'ano naka ni'. which he literally translates as "that inside in".
. Hasegawa Kanajo 長谷川かな女 .
. Chrysanthemum Festival (chooyoo 重陽) . 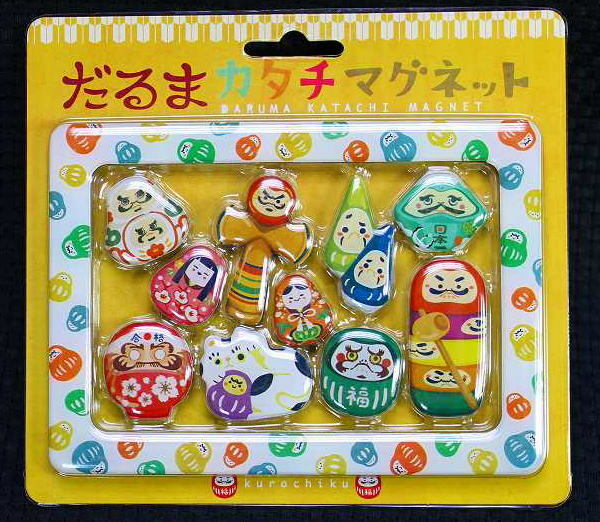 makie Magnet with Daruma, for clipping things to your refrigerator.
. Jizo Bosatsu - ABC-List - . The main entry about Jizo Bosatsu is here.
. Jizoo Bosatsu (Kshitigarbha) 地蔵菩薩 . You will find a famous statue called Kofuku-Jizo (its official name is Kofuku-Jizo Bosatsu which means the happy Jizo Bodhisattva) beside a gate at the end of the stone stairs. When you visit this temple, there is no way to miss meeting him. He is holding a staff in his right hand and a precious stone in his left hand. Tradition says that he comes to you by foot to give you a helping hand and that he will grant you one wish. A lot of people have claimed their wishes came true. 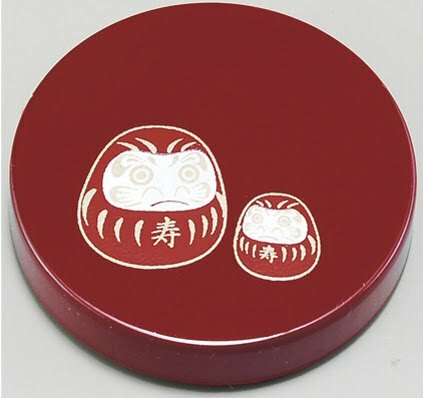 A talisman in which there is a small figure of the Jizo will protect you from unhappiness and misfortune. You can buy it for 300 yen after listening to the priest's lesson. 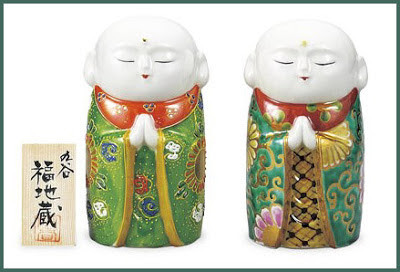 While holding the talisman, go and see the Jizo to wish for your happiness. Please always keep it with you until your wish comes true. Please don't forget to tell the Jizo your address and name so that he can go to see you without becoming lost. What are you going to wish for? where people can hear the sound of Suzumushi singing from early evening. 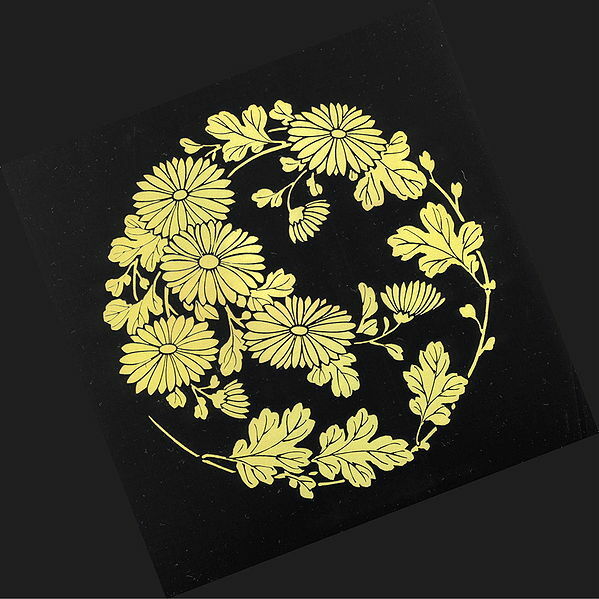 During the period from 1804 to 1830 when the cultural aspects of townspeople of Edo began to thrive, Sahara Kiku-u, a wealthy dealer in antiques, established a garden for enjoying flowers in bloom with the help of other aficionados of the arts. One theory has it that the name "Hyakkaen" was chosen to mean "a garden with a hundred flowers that bloom throughout the four seasons." At the time when the garden first opened, its main feature was 360 ume trees. In later years, many different blooming flowers and plants mentioned in classic Chinese and Japanese works of literature and poetry were collected, enabling visitors to enjoy blooming flowers throughout the year. The garden is the only surviving flower garden from the Edo Period. 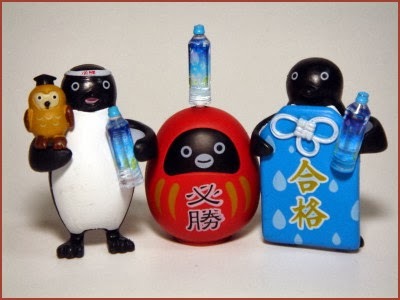 In summer time, they hold Morning Glory Competition and a event called "Mushi-Kiki no Kai". In Japanese, the word "Mushi-Kiki" means "enjoying sounds of insects." By listening to the sounds of insects, Japanese people feel the seasonal beauty and sadness. The journalist and writer Lafcadio Hearn (also known as Koizumi Yakumo), who came to Japan in the Meiji period(1868-1912), expressed his surprise and deep interest at the unique sensitivity of the Japanese people, who admire and listen to insects, and who appreciate the beauty and melancholy of the seasons. 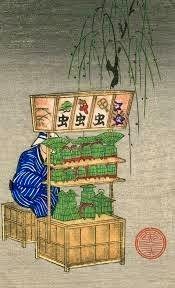 It is said that since the Heian period (794-1185) it was popular to catch insects and keep them in cages, before later releasing them into one's garden to enjoy their chirping. 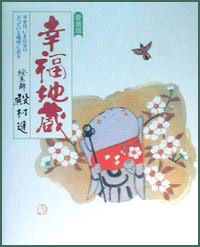 We can find many works dealing with insects in Japanese literature, including tanka poem collections, essays and haiku. As people in the Heian period did, visitors of this garden could release the several chirping insects into the garden at dusk and could lit "Bonbori lights" and "E-Andon lights" at the event. The lamp shade of "E-andons" are made out of Japanese paper and beautiful paintings are drawn and poems are written on them.
. WKD : bell cricket, suzumushi 鈴虫 .
. waraji and zoori　草鞋　－　草履　straw sandals .